This press release has been updated to reflect that the suspect was operating a stolen U-Haul out of Somerville. The suspect has also been charged with Receiving Stolen Property Over $250. SAUGUS — Chief Domenic DiMella reports that the Saugus Police Department arrested a man this morning for allegedly breaking and entering into a building after he fled from police, struck a Revere police cruiser and then crashed into a building. 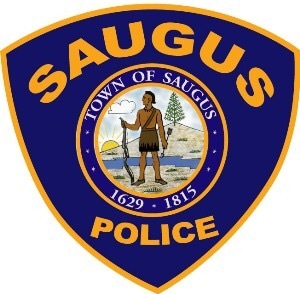 At 3:02 a.m., Saugus Police received a burglary alarm alert from Santoro’s Sub-Villa, 259 Essex St. Just prior to the alarm, a Saugus police officer on patrol noticed a 2017 Ford U-Haul truck parked outside the business. Upon arrival, officers observed that the glass front doors of the shop had been smashed and that the building had been broken into. Shortly thereafter, police observed the U-Haul exit off Route 1 onto Walnut Street. Officers then conducted a motor vehicle stop on the U-Haul, but as they were getting out of their cruisers to investigate, the operator of the U-Haul took off at a high rate of speed. Saugus Police attempted to stop the U-Haul, but when the driver failed to stop, a pursuit ensued. The U-Haul traveled from Lynn, then back into Saugus. As it was entering Revere on Route 107, the U-Haul struck a Revere police cruiser, and then crashed into Gulino’s Auto Body, 1062 Broadway. The driver then exited the U-Haul and fled inside the building. Police located the suspect, identified as SILVIA, inside the building. He was placed under arrest and transported to the Saugus Police Department, where he is being held pending his arraignment at Lynn District Court. No one was injured. At the time that SILVIA struck the Revere police cruiser, the officer was outside the vehicle and was able to move out of the way. The Revere Police and Fire Departments also responded to the scene. The Revere Fire Department immediately began extinguishing a fire that occurred at Gulino’s Auto Body after the U-Haul crashed into the building and then caught fire, causing extension into Gulino’s. Following an investigation, Saugus Police determined that the U-Haul was stolen out of Somerville. This incident remains under investigation by the Saugus Police Department. Saugus Police are also investigating a break-in that occurred earlier this morning at a business located in close proximity to Santoro’s Sub-Villa. Medford:MHS Students Shine At Massachusetts History Day Competition!